I.B. Kleinerts invented the incontinence category in 1869 with the first waterproof rubber pant. Since then we have expanded our range of men’s and women’s incontinence products. Incontinence is a subject that is not discussed often due to the embarrassment it can cause. It is a problem that affects millions and does not discriminate between men and women. Looking at the statistics there are more women that suffer from incontinence then men but recent estimates show that men with this problem total about 5 million and it could be more than that as it seems it is under reported. Many manufactures that have created incontinence products for women have taken notice of the increased demand and now create more products for men including the development of adult diapers and various styles of incontinence underwear. These incontinence undergarments can be worn with or without incontinence pads. 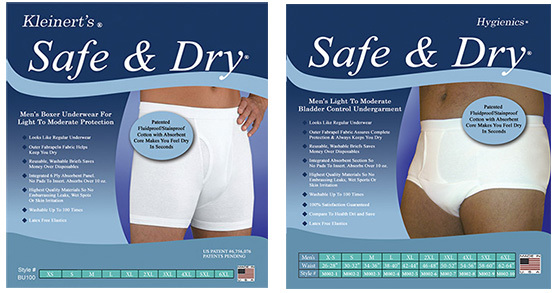 Kleinert’s manufactures its own line of Incontinence Underwear for men known as Safe & Dry. There Is the Safe & Dry Men’s Waterproof Briefs and Safe & Dry Waterproof Boxer Briefs. These are made for men who suffer from light – moderate incontinence and can absorb 10 oz of fluid. The incontinence underwear that we make today uses advancements in production and newer fabrics than were first used. Kleinert’s incontinence underwear for men comes in styles that look and feel much like normal underwear. They can be worn with confidence and discretion. Men who wear this type of incontinence underwear report that they can wear them under almost any type of clothing without detection. Best of all, for the man who wants to choose what style he wears incontinence underwear come in both boxer and brief styles. It is also important to know that incontinence pants or incontinence underwear for men offer the convenience of choosing between washable and disposable. While Kleinert’s incontinence underwear is washable there is also disposable incontinence underwear that can just be thrown away after each use. With Kleinert’s washable incontinence underwear though you can save considerable money by just rewashing the garments 100 times or more. You should also not let the embarrassment of shopping for incontinence products keep you from getting what you need. Our incontinence brief is also available through some VA hospitals pharmacy department. Otherwise just call our customer service department at 1-800-498-7051.